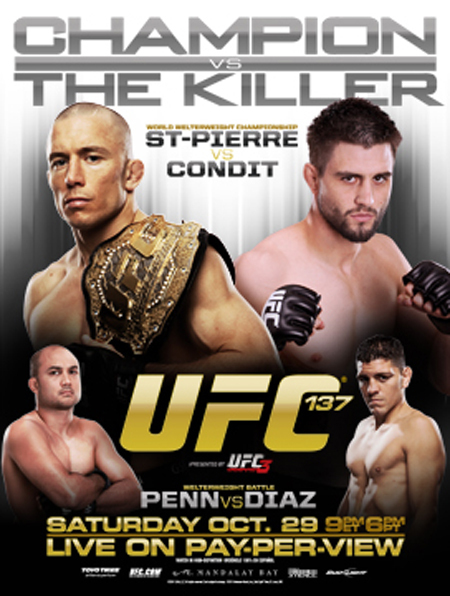 “UFC 137: St-Pierre vs. Condit” is still 15 days away, but the hype train is in full effect. The company has released an extended video preview to promote the Octagon’s October 29th pay-per-view broadcast. The card features a pair of pivotal welterweight scraps. BJ Penn meets former Strikeforce champ Nick Diaz in the co-main event, while UFC king defends his belt against Carlos Condit in the night’s featured attraction. In addition, a heavyweight shootout between Matt Mitrione and Cheick Kongo will also appear in the event. The Mandalay Bay Events Center in Las Vegas, Nevada will host the show.